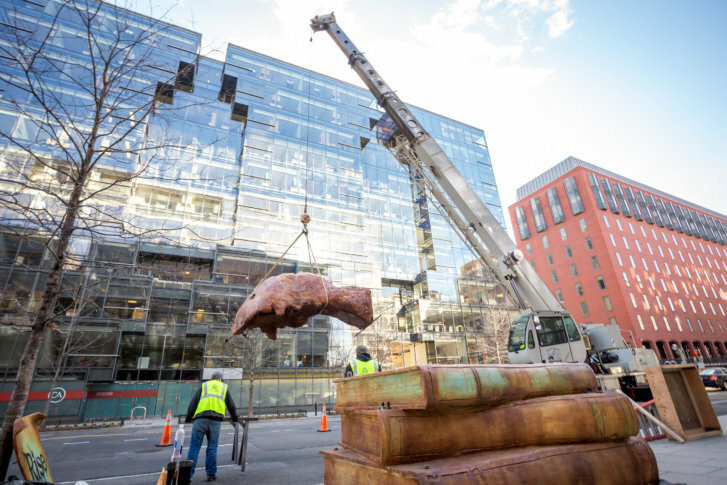 WASHINGTON — Those who work, live or walk around 19th and I Streets NW near Farragut Square may soon find themselves face-to-face with a 14-foot-tall bear. If this happens to you, don’t panic. There’s no need to fear the beast — he is made of 170,000 pennies. The bear, named “Ursa Major,” is one of six pieces of art hitting the streets of D.C.’s Golden Triangle — a 43-square-block of neighborhood that stretches from Dupont Circle to the White House. The large-scale installations are part of a collaboration between the Golden Triangle Business Improvement District and Smithsonian’s Renwick Gallery to bring art from the famed desert festival, Burning Man, to the nation’s capital. “We’re seeing a lot of people who stop with surprise,” said Leona Agouridis, executive director of the Golden Triangle BID. One particular piece of interest in the outdoor exhibit, called “No Spectators: Beyond the Renwick,” is a 5-ton cast cement bust of Maya Angelou on 17th Street, between H and I streets. The looming 20-foot-tall sculpture of the famous poet sits in sharp contrast to the glass office buildings that surround it. Just a few blocks up at the intersection of Connecticut Avenue and K Street is the steel sculpture “Golden Spike” from the artists HYBYCOZO, and around the corner at the Farragut West Metro station is Laura Kimpton’s 20-foot long “XOXO” installation. The outdoor exhibition is an extension of a building-wide exhibit at the Renwick Gallery, called “No Spectators: The Art of Burning Man,” which opens March 30 and runs through Jan. 21, 2019. The six outdoor pieces will be on display through December 2018. Throughout the duration of the two exhibits, the Golden Triangle BID and the Renwick Gallery will host walking tours and events. Maps detailing the artworks and their locations are also spread throughout the neighborhood.